In this fairly light tile-laying offering, players pull a tile from the pool and then place it against one of the previously played tiles. If you create a new object (like a city or a road or a farm), then you can place one of your control markers on the tile to denote your control. As subsequent tiles are arrayed on the board, objects get bigger or even merge. Once certain objects are completed, like roads and cities, then you score the points and the control marker is returned to you. However, it's possible to have all of your control markers locked on the board on incomplete objects. The goal is to have the most points at the end, which can be tricky to control considering your choice for each turn isn't the tile itself, but rather the placement of the tile that you drew. 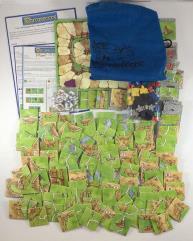 All components combined in the base game box.